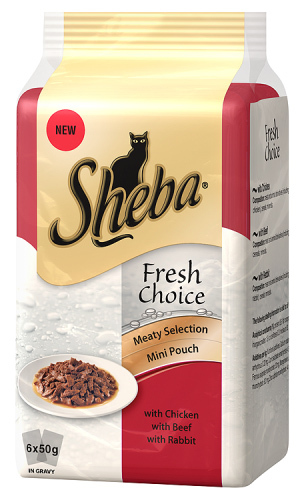 Sheba Fresh Choice pouches are full of small, thin sliced pieces of meat or fish combined with a scrumptious gravy. Every recipe contains quality ingredients and is made to really satisfy a cat's appetite. Due to the smaller size of the pouches, you can always be sure that the food your cat is eating is fresh. Meat and Animal Derivatives (including 4% Chicken), Cereals, Vegetables (including 4% Peas), Minerals. Meat and Animal Derivatives (including 4% Poultry), Cereals, Minerals. Meat and Animal Derivatives, Fish and Fish Derivatives (including 4% Salmon), Cereals, Minerals. Meat and Animal Derivatives, Fish and Fish Derivatives (including 4% Salmon), Cereals, Vegetables (including 4% Peas), Minerals. Meat and Animal Derivatives (including 4% Turkey), Cereals, Vegetables (including 4% Carrots), Minerals. Meat and Animal Derivatives, Fish and Fish Derivatives (including 4% Tuna), Cereals, Minerals. Meat and Animal Derivatives, Fish and Fish Derivatives (including 4% Tuna), Cereals, Vegetables (including 4% Carrots), Minerals. Meat and Animal Derivatives, Fish and Fish Derivatives (including 4% Cod), Cereals, Minerals. Meat and Animal Derivatives (including 4% Chicken), Cereals, Minerals. Meat and Animal Derivatives (including 4% Beef), Cereals, Minerals. Meat and Animal Derivatives (including 4% Rabbit), Cereals, Minerals. There are currently no questions for Sheba Fresh Choice Pouches Cat Food - be the first to ask one!